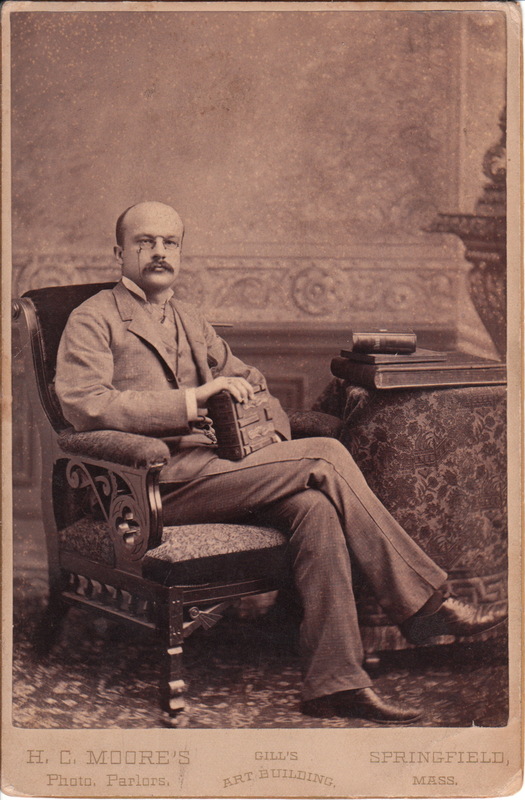 The balding and bespectacled gentleman posing for this cabinet card portrait appears to be a studious man. He is holding a photographic album and and there are books and another album on the table beside him. Hiram C. Moore was the proprietor of the Photo Parlor that produced this photograph. Moore’s studio was located in Springfield, Massachusetts. An advertisement for his studio appeared in the fourth volume of Good Housekeeping (1886). At one time Hiram was partners with his brother Chauncey L. Moore in a Springfield studio. To view photographs by Chauncy Moore, click on the category Photographer: Moore (Chauncey). Thanks for helping me find out more about my great great grandfather and his younger brother. It’s very inspiring. Hiram & Chauncey Moore. Thank you again. One of the aspects of writing this blog that I find very rewarding is when visitors find information about their ancestors. Thanks for letting me know about your experience.